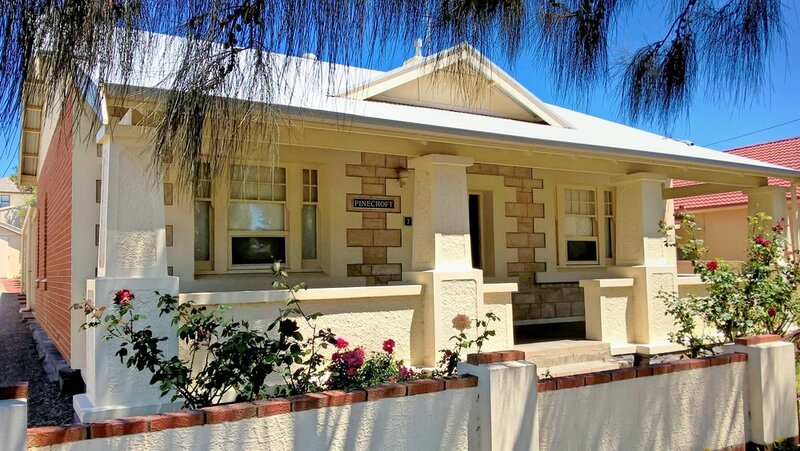 Pinecroft is beautifully located for you to take advantage of all of the attractions of the historic seaside village of Port Elliot. Set on a quiet street, the house is a beautiful blend of the old and new. Four spacious bedrooms, the master with a brand new ensuite, occupy the original 1920s bungalow. The new rear extension provides open plan living/dining and fully self contained kitchen, with dishwasher & microwave. The living area has a comfortable leather lounge suite and large flat screen TV, DVD/Blu-Ray player and R/C air conditioning. There is also a second living area, with Playstation 3, DVD, flat-screen TV, stereo sound system and sofa bed, and a brand new second bathroom/laundry with shower, toilet and washer/dryer. Outside, a BBQ and outdoor setting are housed in a tranquil garden setting under the large back veranda. There is a single garage for use, off street parking and all linen is provided. Free wi-fi is provided via an ultra-fast NBN connection. In all, a perfect place for one or two or families, or to have friends come and visit. Pinecroft allows you to relax and unwind. Everything is within easy reach. Take a 200 metre walk to beautiful Horseshoe Bay or stretch out a bit more and follow the spectacular walk around the rocky headlands to Green Bay and Boomer Beach. Bring your bikes and follow the popular Encounter Bikeway to Goolwa or Victor Harbor. A stroll to the village centre takes in restaurants, coffee shops, the famous Port Elliot bakery and the historic Streamranger Heritage Railway. Shopping in the town centre ranges from the quirky to upmarket, with the old bookshops a particular highlight.